Insurance company GEICO is getting on the NASCAR bandwagon with a recently signed five-year sponsorship deal that allows it to rebrand the camping areas at seven International Speedway Corporation race tracks. 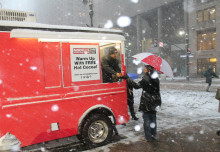 At the Daytona 500 on Feb. 20, the brand set up The GEICO Caveman Campgrounds for tent campers and the GECKO Shores at Lake Loyd for larger Class A Motorhomes across from the Daytona International Speedway in Florida. During the event, GEICO provided the NASCAR tent campers and RV communities with free Wi-Fi with access for up to 65 users at one time. 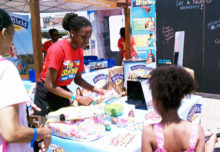 They also engaged fans with beanbag tossing tournaments and premium giveaways, including $200 American Express gift cards after completion of a no obligation follow-up form. 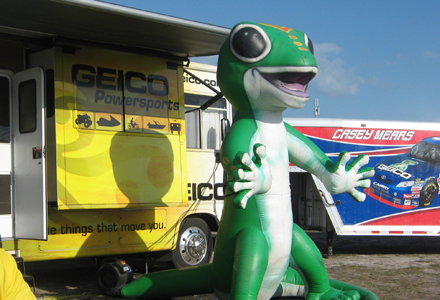 GEICO also had on hand an inflatable version of its popular Gecko character from the brand’s TV commercials for fans to take a picture with.